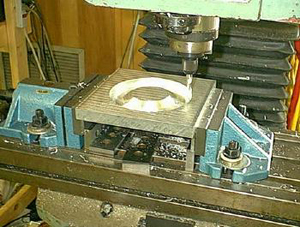 The most challenging pieces were the pulley covers for the 3" Karata Belt Drive system. They had to be light, exact and balanced! We found an Aviation surplus store that had T6061 Aluminum... this is the good stuff all those billet pieces you see are made of... Very strong and light. To make the covers, we took an 8" X 8" X 2" thick piece and split it down the middle on the band saw... no easy task, but it came out fine. 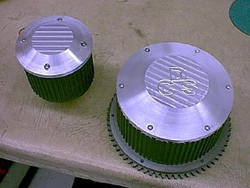 The rear pulley cover has the most machining, as it needs grooves cut to help the clutch cool, and clearance cut in the back for the clutch hub and adjuster. It took about 2,000 passes to get the shape cut and smooth enough to be polished. We HAD to put our initials in the face. 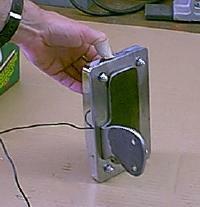 The front pulley cover was much easier as the back of it needed only minor machining. We werethrilled when the bolt holes lined up perfectly and everything fit as it should! 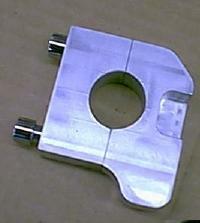 The next tricky piece was a bracket we designed to clamp on the lower frame near the rear pulley. It has three jobs to do. First (see cutout) we had to recess a square area for the brake retaining arm to slip into, instead of using a linkage which would have been ugly. Then (the hole is not there in the picture) we are going to run the brake line thru the piece at the rounded end on the bottom right, to keep things clean. Lastly, we wanted to mount the license plate bracket on the outside, a mere 1/8" from the frame rail. Again the piece was cut on the first try (don't kid yourself, we made probably 10 prototypes out of wood, plastic... anything we could get our hands on), and the finish is great, ready to be chromed! One of the last pieces is the license plate bracket. We wanted to continue the rounded theme from the pipes and other brackets we made, but it had to be stout! Nothing worse than a chromed thin bracket breaking from vibration. We used 3/8" steel, welded a few pieces to form the needed 90 degree angle, and made a nice backing plate. We then (when I say we, I mean Herb!) made a plate that is the exact shape of the Aftermarket (meaning has to be re-chromed for our standards) license plate frame (we got it for the cool invisible illumination it has) so no seams would show, and blind welded the backing plate to it! We even countersunk the acorn nuts so no washers are needed and the bottom of the nuts were hidden. This thing will NEVER break... gotta weigh 3 pounds. Once chromed and bolted to the Brake Bracket above, it will look great and hide the bracket completely!